Does this come in a booklet? It sure does look like it to me, BUT, there is no reference to one in my Scott Catalog. I found out that they were issued as Booklets. 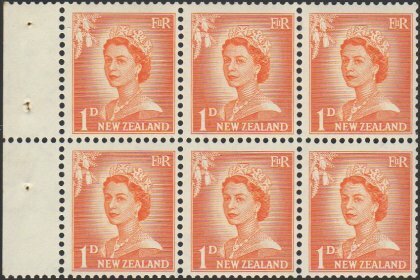 But I had never seen them with straight edges before only a stamp with perf's on all four sides. 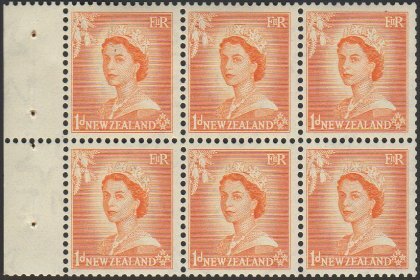 I would say your stamps are not from the booklet panes, but actually coil singles. The coil singles came in strips that were perforated on all 4 sides. You will notice the cut perfs at BOTH top and bottom, which is typical of New Zealand coil strips of that era. I will leave it to our New Zealand stamp bears to confirm or correct. Coil pairs with a counting gutter in between are considered a specialty item. Those types of counting gutters don't exist on US coils. The most we have are spray on counting numbers on the back of some of our modern coils. The US only produced a relatively few booklet panes that were perfed "all around", and most of those were makeshift vending machine booklets. 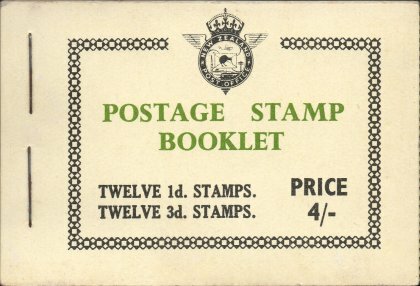 On the other hand, it is not unusual to see British Commonwealth area booklet of the early- to mid-1900s that had booklet panes with fully perfed stamps (where booklet panes were actually separated at the perfs; or in some cases of single stamp booklet panes, the stamp is fully perfed but surrounded by selvage). A few other early European booklets were also produced with perfs all around. Its not my collecting interest but I have never seen one without perfs, and they dont appear in 2 of our local dealers catalogues. Haven't seen coils from that era. Note the cut perfs at top/bottom, typical of a horizontal coil. The leftmost stamp is actually intentionally joined to the pair at right -- this is equivalent to a "paste-up pair" for US coil collectors. Its possible coils could have been produced specifically for businesses. They dont feature in any catalogues here, but I'm still looking for info. These are some other examples I have. There are hints of perf's on them, but the second one I just posted show no perf's. Also, there seems to be a larger white area where the perf's should have cut into. tomd, they all look like vending machine coils to me. The last picture showing the pair, very interesting. I've never seen it like that. The bottom edge clearly shows the serrated cutter on the dispenser, but it appears as if the dispenser was pushing them out as a joined pair each time! I suspect there is a better explanation for the appearance. Anther possibility is a handheld stamp dispenser applying 2 stamps at a time -- but again, I've never seen that before. That's a pic to download for my "stamp anomalies" folder!